And remember: activists are animals, too. Considering it only ran for three television seasons nearly 50 years ago, Star Trek has left quite a mark on popular culture. Of course, it predicted widescreen TVs, desktop computers, and mobile phones — and launched a huge franchise of movies, books, comics, toys, and other shows. Hey, Spock is even a vegetarian. So its enduring influence is understandable. As commander of Starfleet’s USS Enterprise, James T. Kirk was a leader not afraid to gets his hands dirty. 1. Understand what you’re up against. Whether he was quizzing his first officer or the chief engineer of the Enterprise, Captain Kirk wanted to be kept apprised of every detail. Likewise, one of the most critical things we can do as activists is to understand the issues. Every form of animal exploitation — from factory farming and abusement parks to vivisection and the fur industry — comes with a galaxy of statistics and data. While it’s not necessary that we know it all, it’s important that we’re versed enough in the issues to both understand what we’re fighting and be prepared to argue against it. That means not only reading animal rights literature, but the material (studies, reports, websites, etc.) produced or valued by the opposition. Good resources for information from both sides of the factory-farm fence, for example, include Food Empowerment Project, Jack Norris (for vegan-related health), and the ag rag Feedstuffs. 2. Keep your eyes on the prize. It’s easy to get discouraged and lose hope, especially when we’re faced with seemingly insurmountable odds. When his core crew members were held captive by the Melkotians and forced to reenact the 1881 gunfight at the O.K. Corral — meaning certain death for himself, Spock, McCoy, Scotty, and Chekov — the perceptive captain knew enough not to kill his enemy when he had the chance. By the same token, we need to resist the infighting so common in the animal rights movement today and remember the animals. We can waste our time engaging in online arguments about veganism, we can join the haters and bash national groups, we can criticize activists for their “welfarist” tactics … or we can focus our energies on practicing whatever form of animal activism brings us the most satisfaction, whether it be leafleting, tabling, corporate campaigns, direct action, bringing plant-powered desserts to share with our co-workers, or anything in between. Incidentally, as a result of Kirk’s wise display of mercy, the surprised Melkotians opened up a dialogue with their former adversary. 3. If a challenge looks unwinnable, re-write the rules. Faced with a no-win scenario in a training exercise called the Kobayashi Maru — named for a disabled federation freighter — Kirk reprogrammed the simulator, changing the conditions of the test so that it was possible to rescue the ship and thus win. (Some argue he cheated, but Kirk received a commendation for original thinking.) To apply this approach to real-world adversaries like animal exploiters, we need look no further than the new book Changing the Game by longtime animal advocate Norm Phelps. “The world is changing, and the animal rights movement must change with it,” Norm says. “The number of vegans in the US has been stuck at around 3 percent of the population for over a dozen years. If we don’t want to become a small vegan club with little impact on the broader society, we have to change the game.” To liberate animals, we must begin playing by a new set of rules. Norm offers a seven-point program for changing the game, which includes establishing animal rights as a compassionate social justice movement in the progressive public tradition, not a proscriptive private morality movement in the conservative religious tradition; practicing “two-track activism” that simultaneously pursues agitation and politics; and aligning the cause of oppressed animals with the cause of oppressed human beings — an ideal we often preach but rarely practice. Maybe this approach sounds crazy, but such is the curse of original thinking. 4. Set realistic goals. 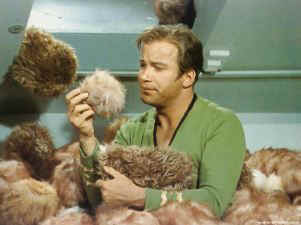 Kirk understood that everyone and everything has limitations, which is why he said in “Metamorphosis” that nothing is ever 100 percent efficient. Likewise, an animal-rights campaign that begins with a lofty objective such as “End factory farming in 5 years” is doomed from the start. Long-term aims are wonderful as an ideal (I would love for the world to go vegan, for example), but we need to be realistic; to do otherwise only leads to frustration and activist burnout. Try embracing a set of achievable, short-term goals that can be acknowledged and celebrated when they are met. These goals can be as modest as volunteering to leaflet at a circus protest or on Fur Free Friday, or something more ambitious, like doing outreach at a community event with your own animal rights table. The most important thing is that we get out there and take action. 5. Enjoy a little R and R. Yes, animal activism is hard. Activists are constantly exposed to horrifying images and narratives infused with animal cruelty. So take a page from Captain Kirk’s playbook and have some fun once in a while. Kirk understood the benefits of rest and relaxation, even if the crew’s attempts at shore leave are never as tranquil as he’d hoped (such as the time on Argelius II when the ghost of Jack of the Ripper popped up). If we’re going to be in this movement long-term, it’s essential we treat ourselves with care. Try to not be too critical of yourself. Take a real vacation once in a while. Get lost in a good book. Go out with friends and have a good time. Remember: activists are animals, too. Kirk must know something. After all, he did save those whales in Star Trek IV: The Voyage Home.